It is morning. 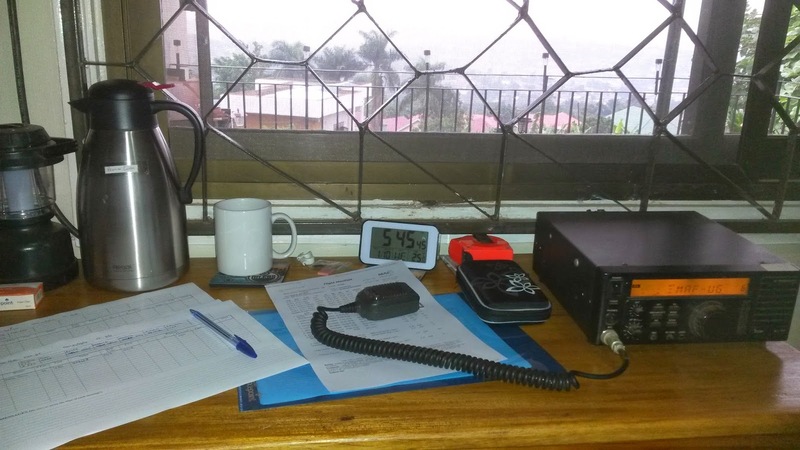 I am sitting here in my office in front of the HF radio waiting for the first call of the day. The rain has just begun to fall and I can just hear it over the crackling and popping of the static on the radio. It's been a while since I've written here, and I figured that it's time to break the silence, if only to explain why the silence has gone on for so long. My radio. Notice that no morning radio operator should ever be without his coffee. For starters, our family was able to head back to Canada for a few weeks this summer. Because it was a shorter break, we were not able to go and visit all of the people that we would have liked, but it was still a great time to rest up and spend time with both Karen and my families. The kids enjoyed the time back in Canada immensely as well, spending time with their cousins on each side of the family, catching up on what had all gone on in the preceding two years. When we left Uganda in late June, I was quite tired and worn out. Our program had been short of pilots for over a year, and the other pilots and I had been flying extremely busy schedules to keep up with the demands of the program. One of the things that made it bearable for me was knowing that there was a reprieve coming up when we left for Canada, and I looked forward to that time with great anticipation. I also knew that while I would be gone the MAF Uganda program was going to be welcoming several new pilot families into the program, and when I returned to Uganda the workload was going to be spread out more. Ahh, there it is. That first radio call of the morning. 5X-FRM, finally taxiing for take-off, on his way up to Gulu in northern Uganda. Although I expected the work to be spread out more when I returned here to Uganda, I had no idea how sparse the flying would actually be for me. Shortly after we left Uganda, the flying for our program slowed to a crawl. Due to factors having nothing to do with MAF, and totally outside our control, we were no longer allowed to fly our airplanes across international borders. Much of our normal flying (about 70%) happens in South Sudan and Congo, so this brought our program back from full speed to a crawl. We now find ourselves in the opposite situation of what it was like earlier in the year. MAF Uganda finally has a full contingent of pilots, but until we are allowed to fly out of country again (hopefully in the next few weeks) each pilot feels lucky to have one flight per week. And now we have radio call number two. FRM is safely airborne and on his way northwards. Good stuff. As I sit here, I find myself in the position of not having flown in almost 3 weeks. I am on the schedule to fly our northern Uganda shuttle this coming Friday, and am looking forward to getting into the air again. Although I have not flown for a while, I have still been able to stay fairly busy. When we were short pilots and were so busy flying, there were several things that kept getting pushed to the bottom of the "to-do" list. These small things were beginning to pile up, and this slow down in flying has allowed us to finish many of these tasks. For myself, a couple of weeks ago I spent the week in Nairobi, Kenya, going through a course called "HEAT" (Hostile Environment Awareness Training). It was both intense and a lot of fun, and all of the scratches and bruises on my arms and body have healed except for one on my arm, which will be gone any day now. Radio call Number three. The pilot of FRM gave me his estimated times of arrival for each of his stops today. Stellar! One thing that has been good about all this lack of flying has to do with the avionics in our airplanes. 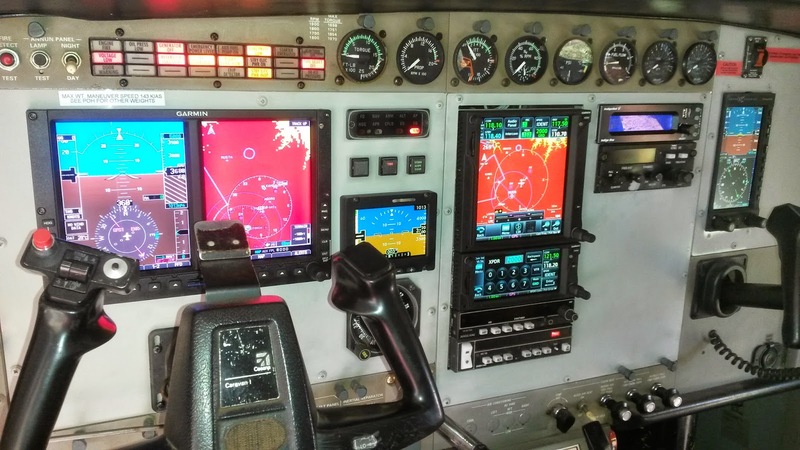 We are in the process of retrofitting our aircraft and bringing them out of the stone age of gauges and into the modern, digital age of shiny touch screens and the like. Retrofitting an aircraft with avionics keeps an airplane out of commission for quite some time, so having a slower flight schedule right now is fine in that regard. That is also what has kept me busy this week. I have been working with one other pilot to begin the work on our second aircraft that will be having the avionics retrofit done on it. 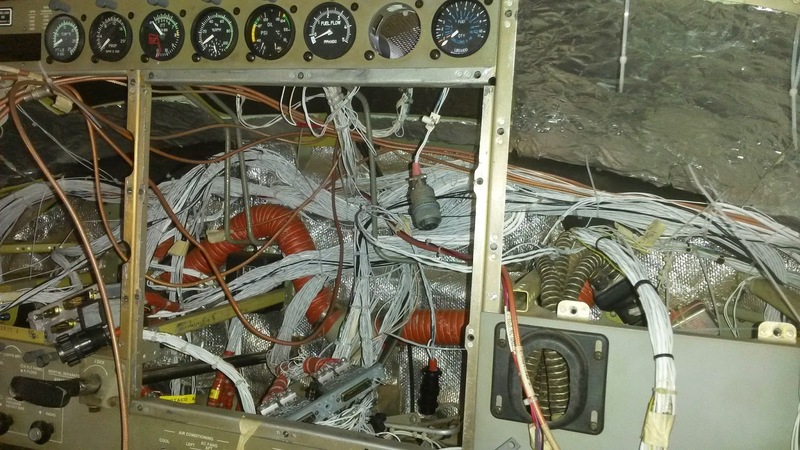 To run all of the gauges and displays on an aircraft there are hundreds, nay, thousands, of wires. Each one is individually labelled and has to be run individually to ensure that each end of each wire is terminating in the correct place. This is what I have been doing this week. This is the wiring loom. 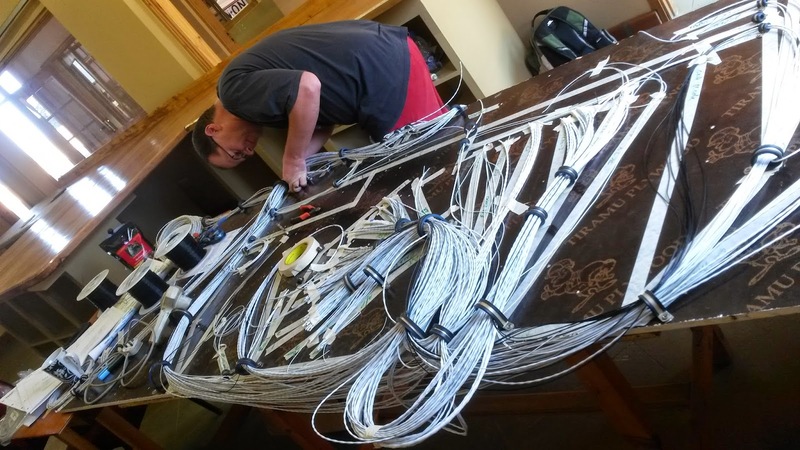 Each wire is run individually by hand. This is the first stage. 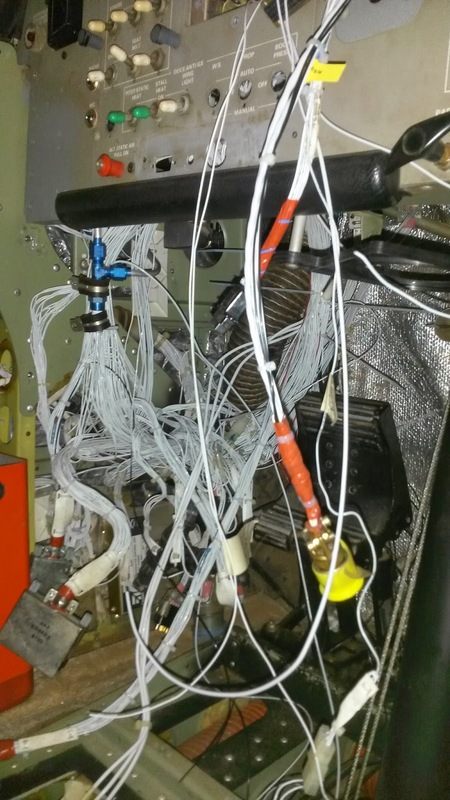 This is what it will look like when the wiring bundle is being installed into the aircraft. Have you ever wondered what it looked like behind all of those gauges and screens up there? Now you know. I should mention that it does look much neater and organised after everything is finished. This is what it looks like now (before the retrofit). Also, a nice shot of yours truly doing my thing, courtesy of Dave Forney. This is what it will look like when the retrofit is completed. Fancy-Schmancy! So, I've called up to our fuel guy in northern Uganda with the ETA for the airplane this morning. Now he'll be waiting there for them with fuel when they arrive. So, that's more or less the short version of what has been going on with our family the last few months. We are so thankful for your prayers and support for our ministry here with MAF. 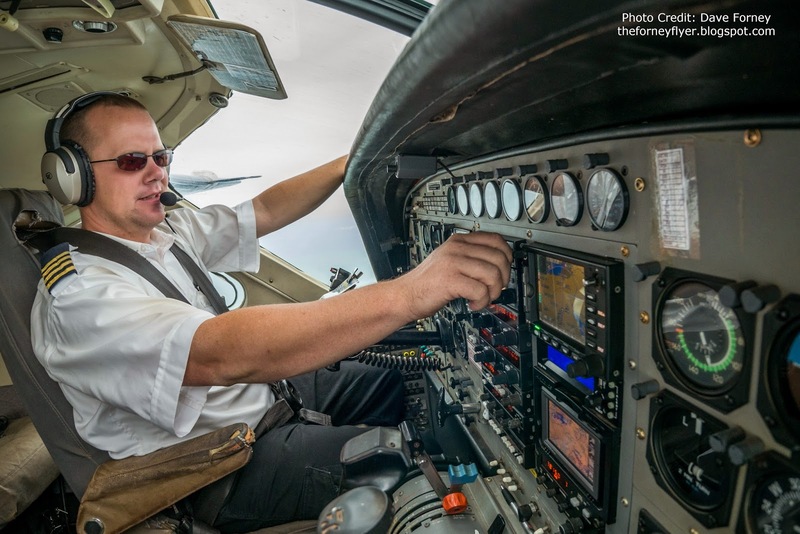 Please pray that we would soon be able to resume flight ops into South Sudan and Congo, and also that the retrofitting for the avionics on our airplanes would go smoothly and quickly. Thanks again for your support, we wouldn't be able to be here without you!